The retail giant's best days seem to be behind it, no matter what its new CEO might have in store. The Dow Jones Industrial Average (DJINDICES:^DJI) on Tuesday fell harder than it has in two weeks, closing below 17,000 points for the 29,550th (give or take a few) trading day in its 118-year history. It was a sharp rebuke -- at least for the short term -- to bullish forecasters who expected breaching 17,000-point barrier to lead to steadier gains and broader optimism. However, despite the Dow's 0.7% drop, its 16,906-point closing price is still the 11th-highest value the index has ever recorded. The question now isn't "can the Dow get back to 17,000?," since it's bound to recover given a long enough timeline, even if it begins to crash tomorrow. The question should be, "how long will it take?" 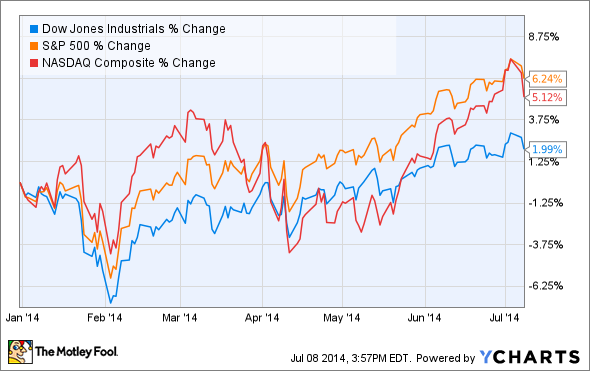 Among all Dow components, only Procter & Gamble, Wal-Mart (NYSE:WMT), and ExxonMobil ended the day on an up note. 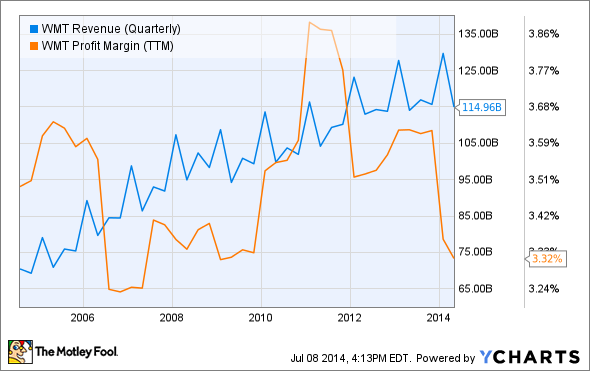 WMT Revenue (Quarterly) data by YCharts. Wal-Mart's efforts will now focus on a larger number of small stores, which could wind up being so small that 20 might fit in a typical company superstore. The retailer will also take cues from Amazon's real-time pricing system at its own e-commerce site, scrapping a long-standing marketing focus on low prices and deep discounts in favor of dynamic adjustments that can adapt to competitors' pricing. Wal-Mart will also promote daily and hourly values on its site, in another nod to (or direct rip off of) Amazon's popular daily deal banners. While Wal-Mart trails far behind Amazon in online revenue, the segment is its brightest star, as the Journal noted a 30% year-over-year improvement to $10 billion in revenue for the most recent fiscal year. Will these changes be enough? A ship worth half a trillion dollars (Wal-Mart's trailing 12-month revenue was $477 billion) can't be expected to turn on a dime. The megaretailer's brand perception is also all but set in stone at this point, which may make it more difficult to lure new customers, regardless of how clever the company's tactics may be. Even if it does grow again domestically, Wal-Mart is unlikely to repeat the market-beating performance it posted during its first decade as a Dow component. From 1997 to 2007, both Wal-Mart's revenue and its share price grew by threefold, roughly tripling the Dow's gain over that time frame. 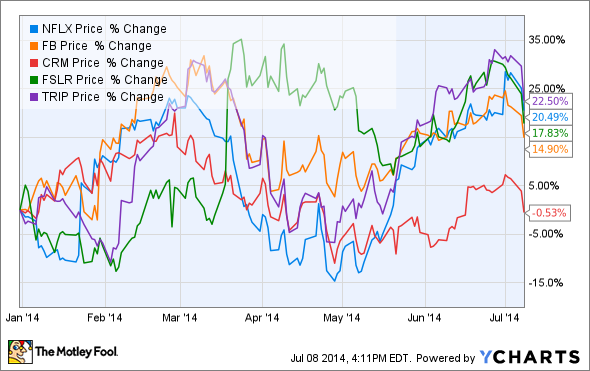 Over the past five years, however, Wal-Mart's top line has grown less than 20% larger.